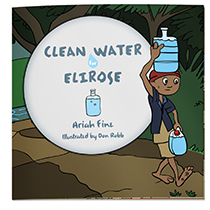 A Children's Book about Clean Water and how you can make a difference! Read the Book Right Now! Maria and her friends love all kinds of different drinks, but when they learn a girl their age doesn’t even have clean water to drink they set out to help. Read about all the great ways these kids help make a difference and how you can too! Everyone loves Clean Water For Elirose. Just see what our Fans have to say about it! "The GFWC Northboro Junior Woman’s Club of Northborough MA donated copies of Clean Water for Elirose to the 6 elementary schools in our town. We hope the book will engender discussion and thoughtfulness about children and water around our global village." "My three year-old loves this book. He's drawn to the bright, clean illustrations and has easily connected with the children in the story. I appreciate having a story that addresses issues of poverty and social justice in a way that's developmentally appropriate-- and hopeful." Share your story about how Clean Water For Elirose has impacted your family or classroom. We like to do things different here, which is why we offer Clean Water for Elirose has a "Pay What You Can" option. Only have a $3? That won't keep you from getting a copy of the book! Pay what you can and know that all profit from book sales goes directly to building clean water wells & Free Shipping! What's stopping you? We are currently at a very limited supply of books in our inventory so Pay What You Can orders will be completed by email. Shoot us an email and we'll work on getting you or your group books right away. Thanks! Please email for details. One of the primary goals of this book is to raise money for clean water projects. All profits from book sales, beyond the cost of the books and shipping goes to fund clean water projects. Currently we are making donations through Charity: Water. In May of 2011, over 1000 books where pre-ordered through our kickstarter fundraising campaign. With the profit from those sales, we purchased a large quantity of books through a traditional printer for about $2 per book final cost. This allows more of each sale to go toward clean water wells in the long term. However, there was no actual profit from the fundraising from those books as it went to purchase the current supply we currently have. Additionally, we've had several water organizations, schools and individuals order large quantities of books at cost. While we did not take a profit from those books to contribute to building wells, many of those individuals and organizations have used them as a fundraising tool and have utilized the profits from those sales to support their own well projects. Finally, from the beginning the book has been available at cost to those who couldn't afford the full price of the book. This is important to this project as one major goal is to education kids about this issue and we believe strongly that cost should not be a hindrance to that. However, it has meant that we have not made a significant profit from sales to contribute to well building. I hope this provides you with a thorough perspective on this book and the goal of contributing funds to well building project, however large or modest they may be. The additional piece we'd like to tackle in 2012 is telling the story of those who have read the book and been inspired to make their own change and raise funds in creative and unique ways to bring clean water to kids like Elirose. Have a story to share? Email us. Help Us Build a Well!